Foodservice toasters are great for busy kitchens or breakfast buffets at hotels. Our commercial toasters from Cadco are quality pieces of restaurant equipment that last for years in the commercial foodservice industry. 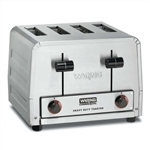 Trust the restaurant supply superstore for your restaurant equipment wholesale toasters for the perfect toast or bagel in the morning. Waring Commercial Toaster 4 Slot - 11.88 in. Wholesale toasters are a valuable asset to any restaurant or hotel buffet that make heating bread and bagels a piece of cake. Put them in your continental breakfast areas for self service, too.